Article of the Month Winners Announced! Oprah Winfrey’s words threw a challenge to me: “The biggest adventure you can take is to live the life of your dreams.” Going after my dreams, however, required more courage than I thought I had. For all the things I wanted to do with astounding, unimaginable, level of skill, I had to overcome the little voice that whispered menacingly …. You … Can’t …. Do …. It. My fear of public speaking was one such voice. I needed to quieten that voice if I wanted people to hear my voice on stage. My first Toastmasters meeting showed me a way to acknowledge and confront my fear and a way to dream. As I saw the speakers deliver speeches to express their ideas and opinions, impress the audience with their style, wit, and humor, I started to dream about taking the stage one day and impressing my audience. I dreamt of a confident Roli mesmerizing her audience with her words and her impossible-to-ignore, captivating stage presence. Just dreaming is not enough. Enduring change doesn’t happen overnight. Commitment and perspiration are key for achieving our aspirations. This means attending almost every meeting, trying different roles, embracing every opportunity to take the stage, and experimenting with the intent to improving every day. The dream of becoming a scintillating speaker is still far into the horizon; it doesn’t seem so unattainable now. One of the side benefits of going after one dream is that a number of other dreams have started to come true since I changed my outlook on the possibility of achieving my dreams. This Newsletter is one such dream that is now transforming into reality. It is not my dream alone. It is a dream that my dream team and I have worked hard to realize. I am extremely fortunate to have had the privilege of working with selfless volunteers whose unstinting contributions have realized this dream. I hope you will enjoy reading this Newsletter as much as we enjoyed creating it. If there’s anything you would like us to incorporate in the future versions of the Newsletter, do write to us at newsletter@d41tm.org. Message from District Director When I was in school, I used to look at the 'Class monitor' with a weird sense of envy because very early in my life I had formed this firm opinion that I could never be like him. A ‘Class Monitor’ was like a superstar for me and I used to think of him as someone possessing some inborn charismatic qualities of a leader which are unattainable for someone like me. This shyness and lack of confidence in my own abilities made me withdraw into the shell that I had foolishly built for myself. My self-confidence did not grow, and I always found reasons to look down upon myself. I remained like that long after I had graduated from the college and even during the first decade of my corporate life. In Sep 2011, I joined Toastmasters. It might seem like an exaggeration, but Toastmasters transformed me completely. It surely wasn’t an overnight transformation. I grew (and am still growing) with every meeting that I attended with the help of positive encouragement and insightful feedback from the members. I improved my skills as a speaker. I could also enhance my self-confidence and self-esteem by leaps and bounds. The day I became the President of East Delhi Toastmasters Club in Jan 2013, the lifelong regret of having never shown the courage to try to become a class monitor – vaporized! I had joined Toastmasters for the sole purpose of enhancing my speaking skills. But I didn’t take long to realize that Toastmaster is much more than just a platform to acquire and hone the speaking skills. For me, the biggest advantage of joining Toastmasters was to have got the wonderful opportunity of meeting positive and self-motivated members from whom I could learn a lot. Toastmasters shattered that myth for me that “Leaders are born”. The confidence that I gained in Toastmasters helped me to also become a better person in my professional and personal life. I consider it a privilege and an honour to have got this opportunity of leading the district as the “District Director”. Message from District Director But will the completion of my term in June 2019 be the end of my journey in Toastmasters? Of course not! There is a lot to learn and there is a long way to go and I am enjoying every bit of this journey in Toastmasters with the fellow travellers. Toastmasters made me see the veracity of this oftquoted adage “It is never too late to be what you might have been.” I no longer regret what I couldn’t do earlier. I now see an ocean of opportunities ahead of me. Today, I know I can achieve anything that I can dream, and I am dreaming BIG these days. What about you? 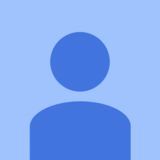 Message from Program Quality Director Do you fear that your skills won’t be relevant in the market in a few years? Do you fear that you would always live a mediocre life? Do you fear you will grow old sooner without making any difference? Do you fear not reaching your maximum potential? Do you have a fear of uncertainty? I used to be afraid of all those things and most notably ‘uncertainty’. When you are plagued with fear, its natural that you do things which keep you at a “low risk” like being in a job doing things that you may not necessarily like doing. “Low risk” generally comes with “low reward”! What is the reason why we fear ‘uncertainty’? May be because we cannot prepare ourselves for it. But what if I tell you there is a way by which we can combat ‘uncertainty’ and that is by honing skills that will never let us go out of business. These are the two important skills that form the core of our organization ‘Toastmasters’Leadership and communication skills. While most of our members get enough chance to hone their communication skills, a lot of them complain that they do not get exposure and the right platform to hone their leadership skills. Based on my 5+ years of experience of thriving in this organization, here are my 5 suggestions to answer how you can get more leadership opportunities. Be best at what you do in your club: Even if you are playing a role of an SAA, do it in a way that you are able to do justice with it. We have had ‘SAA’s’ in many clubs who win the award for “Best Role player” over “Toastmaster of the day” by their sheer dedication. “Club secretaries” who have set precedence in the district by bringing a totally different format of issuing “Minutes of meeting” to the members who couldn’t make to the meeting. If you are playing a role or delivering a speech, do it with utmost sincerity and dedication so that you are able to add value by what you speak or what you do, and you are bound to get noticed by people or further progression. Message from Program Quality Director My best Toastmasters experience has been that of a VP – Ed of Faridabad Toastmasters club. I always use to try and make our meetings more interesting with learning and fun. Meet new people/ learn from the best: Every member needs to understand the wide horizon of Toastmasters. Are you a member of a club which has 20 members or a district which has 4K+ members or Toastmasters International which has 3.5 Lac+ members? We all are a member of a global community. The more people we meet and connect with, the more we get to learn. Sometimes the best opportunities come from talking to random people. Always be proactive: With massive transformation happening in our organization and the world, there is no dearth of opportunities. One needs to be proactive in approaching the senior leadership and offering help. Most leaders we have in our District are the ones who were noticed because they were solving some problem or the other. Be a problem solver and not a problem maker: Some people by design have this innate urge to highlight the challenges and problems around them without offering any plausible solution by themselves. If you are eying to be a leader, you should not be one of them. You should be a “problem solver” rather than a “problem maker”. Nobody wants to get a “problem maker” on his/ her team and later be engulfed in conflict resolution forever. Enjoy your current role: At the end of the day, it all boils down to your own enthusiasm for what you are doing. Are you enjoying what you are doing currently or are you anxiously waiting for the next opportunity? Your enthusiasm for the current role will help you in making a mark. Achievers always get more opportunities than the ones who merely blabber or count on the past success. Message from Program Quality Director There may be a few exceptions, but most people learn leadership real time. By being in real life situations, by making mistakes, learning from them and gaining new experiences. It is essentially the change of ‘perspective’ or getting the “right perspective”. In this era of massive transformation in industries and organizations, the two skills that keep you on top are Communication and Leadership. Leadership is one of the most ignored yet important skill. The ability of getting things done, sound delegation, motivation, conflict resolution and critical thinking comes handy for adding value to any process, organization and to lives of many people. One must look out for more “leadership opportunities” in and out of Toastmasters to truly transform his/her life! Message from Club Growth Director My friends often ask, “Why do you spend so much time in Toastmaster clubs? Aren't evenings meant to have fun, rather than dress up like a professional?” I always tried to convince them, using our USP qualities – leadership, communication, self-confidence, management and public speaking. These words helped me to promote Toastmasters to strangers but not to my friends. I figured out that I needed to improve my impromptu speaking skills. It’s been 9 months since I took charge as the Club Growth Director of District 41. We have opened 24 clubs and as you read this, we are opening even more. We have added new states and cities to our District geography. As a district, we might be leading in the world in terms of numbers. The reason behind this success is not the District Officers. It's those dedicated leaders who decided to roll up their sleeves and start working on the ground for a unique cause. I have met many leaders across the district, without titles or badges helping the district and the Toastmasters community selflessly - travelling for demo meetings, delivering speeches at remote places, mentoring new members and supporting them to become better leaders. These leaders are the real inspiration, which in turn, is helping me to change. Toastmasters has changed my life and is helping me to grow and become a better person. I owe a lot to this organization and no matter how much I serve, it will not be enough to pay back. I have seen Toastmasters helping people change their lives and today, if someone asks me ‘Why ?’ I have an answer – As a leader I am just an instrument, to help people change their lives. Message from District Public Relations Manager Dear Readers, We all talk about leadership every day but seldom do we understand the significance of small things that create huge impact in cultivating leadership skills. When we were searching for “The Secrets to Great Leadership”, we got so many pointers that we would like to share them with you. In this edition, I want to talk about activities that strengthen your leadership skills, habits that shape your decision making skills, traits that enhance your managerial skills and many more. There were times when I did things subconsciously because they were rules of my house, which later on translated as a part of my day to day life routine. These activities were grooming me to be a better leader without me realizing their worth. One such rule was - Early to bed and early to rise, makes a man healthy, wealthy and wise. It was one of the toughest rules during school days but today, this is my key to stress & time management. This gives me at least 6 hours of sound sleep and with enough time in morning to go for a jog, complete my work of Club and District, cook my own lunch and perform many other activities. This also give me ample time to plan out my day and map my tasks. Moreover, research has shown that, not only are early risers more optimistic and conscientious, but also anticipate problems early and minimize them more efficiently. Want to learn time management and increase your productivity? Get up an hour early and you will get the much needed 25th hour of the day. Let us learn from the leaders and improve our skills set. With each passing day, let us together try to be a better version of ourselves. As a 90’s kid, I always grew up watching more male population whenever I saw any leader’s summit, case study challenges or CEOs interview. Rare were the glances when I saw any female coming up on these platforms. But these rare glances caught my attention as a kid. Indra Nooyi – CEO of PepsiCo, Arundhati Bhattacharya - former chairman of the State Bank of India, Gita Gopinath – Chief economist of IMF were the people whom my eye sparkled on because of their confidence & personality. Then only, my little heart planted a DREAM inside me whispering, “Sristy, you have to be one of the hotshots in the corporate world one day! !” Little did I knew that only getting degrees won’t suffice my dream. At a much later stage I understood that the obligation here is confidence, leadership & communication skills. Therefore, this was the dream that I envisioned before joining Toastmasters. To groom myself as a speaker, as a leader & as a person. And it’s been a year now since I have a Toastmaster tag before my name – TM Sristy & since then the progress has been consistent. From the very first guest introduction of mine in Jan ’18 to my recent pathways speech in Jan ’19, the graph has just swiped across. And trust me, it’s not bragging at all. Toastmasters has helped me in being more poised & confident now in handling situations in office or otherwise. It has helped in replacing few of my traits: Anxiety has turned into calmness… Self-doubt has changed into a “let’s try” attitude… The girl who never use to raise hand for any activity has started raising it first now… And these little & gradual changes are taking me towards my dream. But as aptly said that improvement is not a destination, it’s a journey. And to extract most out of this journey, one needs to be consistent, regular and involved. And to do that, one of the thing that’s a must have is Time. I always find it difficult to provide my Toastmasters journey an apt amount of time as needed. Working on this roadblock by planning & prioritizing things. Keeping my fingers crossed that I will be able to cross this hurdle soon and come up with flying colors. Additionally, I strongly believe in one of the sayings by Dr. APJ Kalam ji that “Dream is not the thing you see in sleep but is that thing that doesn't let you sleep.” So, by Toastmasters by my side, big corporate dream in my heart and this quote in my mind, I think that I will surely turn this DREAM into my reality and will move towards the paradise that once a little girl envisioned. Transforming Dreams into Reality Prabhav Agarwal VP Membership Salt Lake Toastmasters Club Division PR Manager, Division K (Area: 3, Division: K) With great ambition comes great dreams and with great dreams come great responsibility. This is my version of Spiderman. I believe dreams when not given the due respect convert into night mares to haunt you. And these nightmares when not catered, grow exponentially, killing you within you. At my age, a dream isn’t just my dream, it is my parents’ dream, my tuition teacher’s dream, my friend’s dream and many more stakeholders are involved. Stating it, my dream asks me to hold a strategic position in a Multinational Company and make key decisions to leave a lasting impact on the society. This when discussed at length, ‘twas laughed at! Nevertheless I regained, and got up from my sleep. My dream in Toastmasters was no different. Entering the room when there’s an applause always felt like a betrayed appreciation on compulsion. I wanted to convert this. My dream is to achieve such heights as a public speaker, that no matter which room am I standing in front of, no matter whoever sits inside, STARTS clapping as soon as I enter. I don’t want to wait for the applause, but their hands should wait for me to enter to start of rattling. I know, it is only on this platform that I can get these foolish proud dreams fulfilled. Well, Toastmasters isn’t about communication or public speaking only. It is more about leadership, networking and opportunities. Having delivered only a few speeches climbing up my path slowly, I gave up on my dream. I realised I was too slow. But, on the brighter side, one evening, standing at the gate, at the end of the meeting (as the VP Membership of my club) holding a diary, a pen, a card and a bunch of words within my mouth I started off - “Toastmasters is where you should be every Tuesday evening. It helps you grow in a vibrant atmosphere and.... .” blah blah. That speech that day motivated 5 of them straight. They were mesmerised. They approached me for tips. And I just had one answer - JOIN TOASTMASTERS! And guess what they are members now!!! It is that day when I realised, that speeches had their own role and leadership, its own. 5 members though being a single digit, but is a very big number! And here, while trying to be a leader I grew up to be a speaker. A speaker whom I am proud of. A speaker whom my club is proud of. A speaker whom all above stakeholders (mentioned) are proud of. And that was my partial achievement. Having identified the roadblocks of my dream, I am more prepared now. I know that the prepared speeches is what will make my content stronger and will strengthen the characteristics of research, planning and initiation in me. These are speeches where I can be more creative, more thoughtful and can convey the deeper meanings of life. And all-in-all, these speeches, the leadership roles and networking when wired together, will make me achieve my DREAM as the best public speaker. The experiences that this community has provided me, have made me believe strongly in the power of self-belief and dreaming big. As I look forward to the upcoming adventures, the following words from Walt Disney keep echoing in my mind: "If you can dream it, you can do it." 6. Understand Ethos, Logos, Pathos – are integrity, logic, and passion respectively. Successful speeches have more than 60% pathos, or passion in them. Passion helps establish a connect with the audience. Do not mistake passion for impression. Passion leaves an impression, impression doesn’t necessarily invoke passion. 7. Incorporate Reinforcement – Ever notice that the chorus in a song comes at about two minutes or less? The reason for that is that human attention span when listening is less than two minutes. So, the human mind needs reinforcement at least three times in a 5-7-minute speech. This gives you a wonderful occasion to reinforce your message. Utilize the chance. 8. Ensure they Listen– with not just their ears. Engage their other senses as well. If they close their eyes and listen to your speech, they should be able to visualize your speech. If they can mute your speech and watch you speaking, they should be able to comprehend what you are saying. If you take them to a beach in your speech, they should feel the splash of waves on their faces. If you take them to the top of the mountain where it is cold, they should be shivering. If you take them to a warm, humid place, they should be sweating. The more senses you engage, the more effective is your speech. 9. Answer this Question – What is it they should remember about your speech? When you are done with your speech, why must they keep talking about you? That is when your speech becomes a benchmark for other speeches to meet or exceed. 10. Enjoy Your Time on Stage – When you get there on the stage, remember you are among the top 10% of the Toastmasters worldwide. Rest of them don’t get that privilege. Don’t go with a mentality of placing first, second, or third. Go with the mentality of having fun on stage. If you can be the same person on the stage as you are off it, you will increase your chances of winning. For more details, you can view the complete tutorial on my YouTube channel. The handle is dtm.rupinder. Do participate, it places you among the top 10% of the Toastmasters worldwide. Follow these tips, and that percentage will drop to single digits. "I am sure it isn't much and would be easily manageable". I wasn't too sure what the District Director, DTM Sandeep Raturi meant when he requested me to take up the position of District 41 Chief Judge. Still, I decided to support the District 41 team through thick and thin as a member of the Program Quality Director's (PQD) team. The experience, so far, has been about both yearning and learning, which I had not anticipated. Many of you will agree with me that the Chief Judge (or CJ) and Contest Chair (or the Chair) play an important role in the conduct of Toastmasters contests. Not surprising, therefore, that due to a dearth of Chief Judges and Judges in the District, one of the first tasks was to ensure that every Division organised at least one Judges Training Program as well as the Chief Judges Training Program in each of the two contest cycles. To the credit of the Division Directors and the District Trio, these trainings were successfully organised across all the Divisions. At the outset, it was decided that only those trainings approved by the Division Directors and the PQD team would be authorised. Even the names of trainers for these trainings had to be agreed with the PQD team to ensure quality was maintained. This led to disgruntlement and resentment that the PQD team was authoritative. But better sense prevailed and in the end, the trainings were conducted successfully.Â It led us to hope that the CJ would find it easier to get judges and other role players for the contests. When someone is entrusted with responsibility in a contest, the person ought to feel elated for being considered. But my experience also shows that this may not always be true. Whenever someone is approached to take up role of a CJ or the Chair, especially, at the Club level contest, one assumes that the organisers were unable to find another scapegoat or want to be quickly relieved of responsibilities for finding role players. Some CJs take their role seriously and request for the trained judges list from the District CJ, even if they have to WhatsApp or call the person in the middle of the night. After the list is received, the CJ gets in touch with may be two or three dozen trained judges over email or WhatsApp; many of them they would have probably never contacted otherwise. Despite these efforts, chances are that just 5 or 6 of the 'trained' judges may reply positively. To meet the legitimate requirement for the contests, the CJÂ may still have to contact a few more TMs and even plead with them to participate. I have also come across TMs who accepted the role of a judge as they had been nominated CJ in another contest and were themselves looking for judges. They believed that some of the judges for the other contest could be mobilised. Getting role players has always been a challenge. Despite the detailed and meticulous planning, including sharing the contest rulebook, guidelines as well as the contest kits and scripts of role players, there may be several hiccups to the actual implementation.Â After all to err is human. These may include the non-availability of role players, judges backing out at the last moment, the scripts and contest kits being misplaced or forms falling short of the required numbers. There have been contests when the judges and role players reached the venue on time, but the contest was delayed as the CJ and the Chair were both late. Sometimes, the CJ arrived last as he was making last-minute attempts to get the judges to accompany him to the contest. Once, the CJ withdrew at the last minute as he fell sick and there were shortage of judges.Â There were last-minute swapping of roles and even the Contest Chair was oblivious to the changes! For obvious reasons, when the organisation of contest is less than perfect, the contestants may have much to worry. This may also be one reason that there have been accusations of the judges and role players being partial. Judging is definitely a difficult task, especially when the contestants have the same level of competence and there is little difference in performance. Every Toastmaster should don the judgeâ&#x20AC;&#x2122;s mantle at least once to understand the nuances of selecting a winner at a contest. It is true that at times judging becomes more subjective than objective (based on the ballot paper). That is where the CJ's reminder at the briefing of the judges to ensure fairness in contests should be remembered: judges have to rank contestants based on the day's performance and not on their past performance; speakers should not be assessed based on your norms or your club norms; and judges should neither give a break to the underdog, nor have a halo and reverse-halo effect of a contestant. TI informed us that contests are held "to recognize individual Toastmasters as an encouragement to all, and to provide an opportunity for all Toastmasters to learn by observing speakers who have benefited from their Toastmasters training" and hence, it is important to also participate actively and in an unbiased manner as contest officials so as to select the best to represent the District at international as well as in the District level contests. Transforming dreams into reality requires a dream and a passion to actualize the dream. 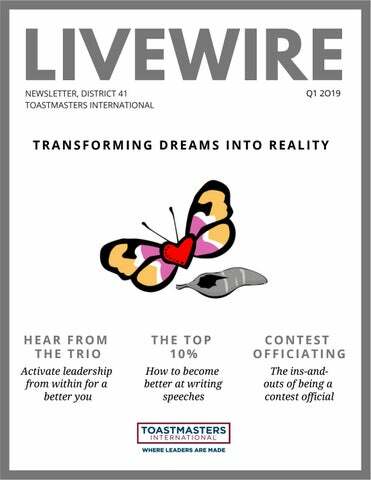 Read how District 41 is pursuing its dreams in the latest District 41 Newsletter - LIVEWIRE Q1 2019!